A series of ITC contacts have convinced me that Atlantis was located in the North Atlantic, with its capital of Basileia near modern-day Helgoland, and science may be starting to look in the right directions. (Ancient legends about the Fall of Man) are based on a factual incident: the downfall of the civilization you often call Atlantis, also known by other names. This downfall was brought about by the descendants of the last inhabitants of Marduk who became marooned on planet Terra. This downfall came through reliance and blind trust in a massive technology. Project Sothis started 20,000 years ago. Its final phase took place in Atlantis. Basilaie was the king’s island in an empire that sank in the middle of the 13th century B.C. It was located east of Helgoland. Diving expeditions have meanwhile located in the waters of a boulder field the ruins of manmade walls. The Atlanteans were not necessarily the kind of people that many of you imagine. They did have a great culture, but they also had a great fleet that attacked and robbed the Mediterranean countries…. Warrior sailors (had) long swords, horned helmets, ships’ bows built like the neck of a swan…. 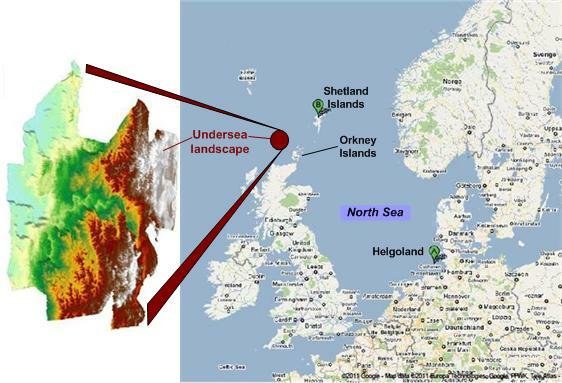 This particular land mass found recently by the geologists is buried a mile below the seabed, so it probably sank into the ocean some 56 million years ago, long before Atlantis sank 3,400 years ago. This entry was posted in Heaven and Earth, ITC, ITC Gems, Our ancient heritage, Science and Technology, Worldly matters and tagged Atlantis, Basileia, Helgoland, science and Atlantis. Bookmark the permalink. I don’t quite get how a spacefaring human civilization could lose ALL of its technology, and none of it remain, coming from another planet in our star system, and end up as essentially primitive proto-Vikings. The descriptions of Atlantis and Sothis here, etc., seem very mythological in the telling, and not very much factual. It’s pretty, and poetical…but not scientific in the telling. Superhumans from Marduk (Eden) came to Earth long, long ago and became marooned here when their world was destroyed by advanced technologies. The colonists had brought some of those advanced technologies with them to Earth. Their descendants later developed the Atlantis civilization and deployed some of those advanced technologies, and the technologies destroyed Atlantis as they had destroyed their ancestral home planet long, long before. That is the basic storyline that I’m confident is true. Marduk was a physical planet in our solar system, between Mars and Jupiter. The destruction of Marduk may have happened more than 3 billion years ago, while the final destruction of Atlantis may have been about 3 THOUSAND years ago… bearing in mind here that time is relative and illusory, so that the time that passed may not have “seemed” as long as 3 billion years would seem to us today. Even so, a LOT would have happened on Earth, involving those advanced technologies, in the long span between colonization of Earth by Edenites and the creation of Atlantis by their descendants. I suspect there was a lot of bio-engineering underway that shaped much of the evolution of life forms in our world, including various species of humans that science has not yet dug up. In conclusion, I agree that the above scenario, including both the ethereal messages and the interpretations, doesn’t sound scientific at all. Being nonscientific can have not just disadvantages but also many advantages. As you break away from the limitations of modern science you can start to explore finer spiritual pursuits, multidimensional living, connection with our higher self, and so on. I agree Mark, well said. 🙂 However it is my notion that science and spirituality, or what some may call religion, are one, and are increasingly becoming one considering the advancements of physics and our knowledge, mainly, therein. The higher realms exist on levels that science hasn’t yet fleshed out yet, but is hinting at now…and the higher sciences of the future I have no doubt will. Stephen, I agree with you too. Quantum physics is starting to study the effects of consciousness (spirit) on matter, and string theory is starting to poke into multiple dimensions. Still… very slow progress into these vast and flourishing realms. I agree, though, eventually scientists will explore deeply into spirit. It’s their purpose, after all, to learn the truth of things, eh?